Celebrate spring with us by taking a glimpse of Japanese fashion spanning a thousand years in this film series. April is also the month that international fashion icon Issey Miyake celebrates his 80th birthday on April 22! @ JFT, free admission, RSVP required. For other films in the Fashion Films Series click here. In 1965, the country was ushering in a new era of oil from the days of coal. The location is in Iwaki-city, Fukushima Prefecture, where there was the biggest coal mine on the main island of Japan. In order to save the town, which is ailing as a result of large-scale reductions at the coal mine, a project is launched to build a Hawaiian-style paradise in this northern town. The film is based on a true story about the people who supported the construction of the leisure facility, “Joban Hawaiian Center”. A high school girl, Kimiko (Aoi Yu), lives with her brother and her mother who works at the coal mine. 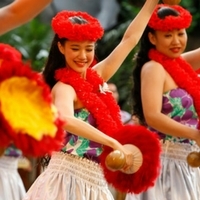 Kimiko applies for a post as a Hawaiian Dancer despite fierce opposition from her mother. A former star dancer, Madoka (Matsuyuki Yasuko), is brought in from Tokyo as a dance teacher. She ridicules the coal mine and the unsophisticated girls at first, however, the girls’ single-minded devotion gradually rekindles her almost forgotten passion. The girls continue with their rigorous and intensive training despite the harsh realities each girl is faced with, and the day of the opening finally arrives. Directed by Lee Sang-il of Scrap Heaven. The total film attendance exceeded 1 million people, and the film won 10 awards from the Japan Academy Prize.